I first saw Furuta-Sensei on the second class of Hatsumi I attended. “Who IS this guy?” I wondered. He was wearing the shihan patch on his gi, but I didn’t recognize the face. When the class formally started, all the other people paired up quickly, and like Shiraishi-Sensei he saw me left by myself, took pity on me and decided to pair up with me. And when it was his turn to do what Hatsumi Soke demonstrated, he replicated Hatsumi Soke’s movement completely. Not only that, he would comment on his movement, so that I would know exactly what he was doing. “…catch… release… catch… release…” This was exactly what I needed, someone who could break down Hatsumi Soke’s movement into chunks, giving me SOME hope of being about to recreate the same thing. So when he told me he was teaching at the Hombu Dojo the next day, I shelved my original plans for that time, scrapped together what cash I had, and made my way down to the Hombu Dojo again for my very last training session in Japan. 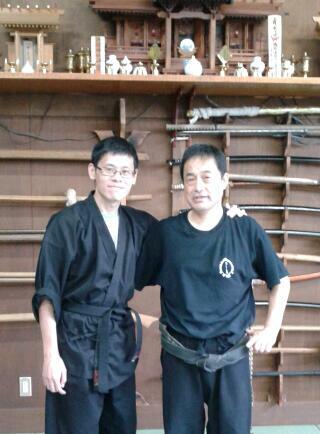 Training with Furuta-Sensei was great. He wasn’t a well-known teacher, so his class at the Hombu Dojo was small, with lots of personal attention and coaching. He was also a structured, systematic teacher, having us start with weird movement drills that felt really silly, then moving on from there to deceptive, confusing movement that would leave the opponent off-balance and confused. He could speak enough English to handle the class (“…catch… release… catch… release…”)and was really friendly and warm. So if you want training that is off the beaten track, I can wholeheartedly recommend that you train with Furuta-Sensei when you go Japan!